Home Uncategorized Rus Powell’s Recordings are in the Can! Rus Powell at the Go to Your Room Studio. 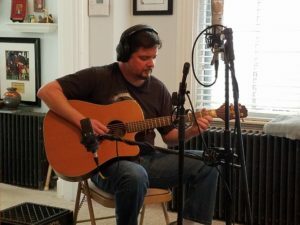 Rus Powell, the first artist to record his music with the assistance of KentuckyJam.org, has just wrapped up his sessions at the Go to Your Room Studio. The music is now in the experienced hands of award-winning producer Chris Werner. A finished and polished recording of Rus’ beautiful songs is just around the corner. The next step is to design the physical CD cover and have the CDs printed and published. Each of these steps will obviously cost money. You can help with a tax-deductible donation to KentuckyJam.org. We operate on a small budget, so even the smallest donations make a difference.